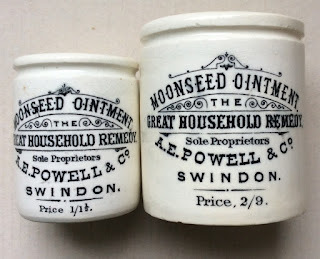 This page shows the 'Moonseed' ointment pots originating from Swindon in Wiltshire. The Great Household Remedy, was supposed to have cured. Interestingly, the pamphlet indicates that three sizes were available. To date, pots carrying prices of 1/1½ and 2/9 are the known sizes that exist. There could possibly be a larger size pot with a price tag of 4/6? 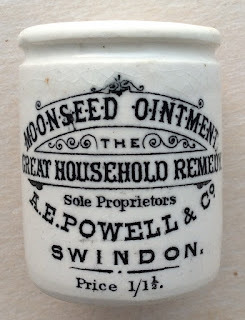 Incidently, the Moonseed plant grows in America and Canada and was taken internally as a general tonic, and used externally in ointment form to treat sores. 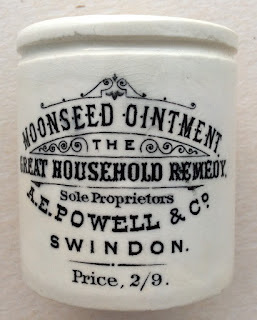 Further detailed information regarding the Moonseed ointment can be obtained from the Historical Guide to Delftware and Victorian Ointment Pots book produced by Messrs. Houghton & Priestley, page 104.